Foundry Origin was developed by Freda Sack and Stuart de Rozario in the Foundry studio in London. It was released in October 2008. Foundry Origin has a very strong horizontal emphasis and works in exceptionally small sizes in print and on screen. 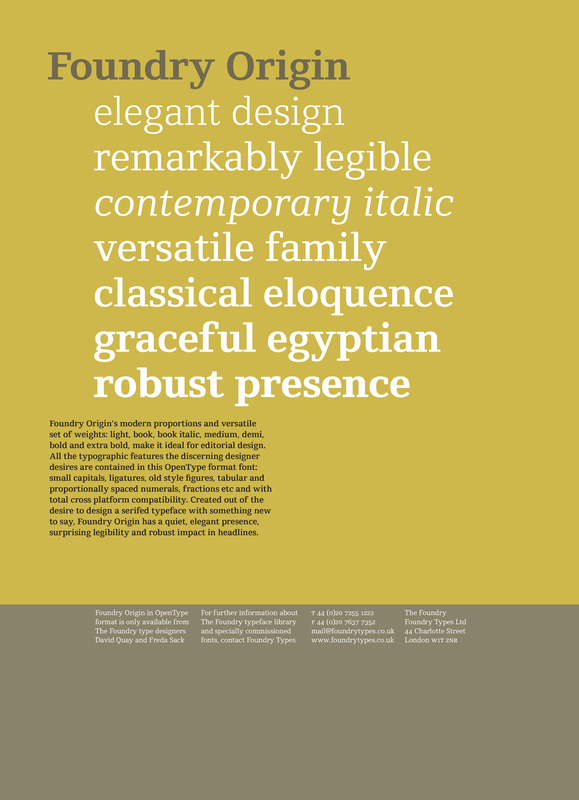 Foundry Origin has an elemental quality hinting at its ‘egyptian’ roots. Developed out of the desire to create a serif typeface with a difference, Foundry Origin’s elegant design and versatile family of weights, with lyrical cursive italic, generous x-height and classical proportions, make it ideal for editorial and information design. A quiet design with a big presence, tipped to become a modern classic.